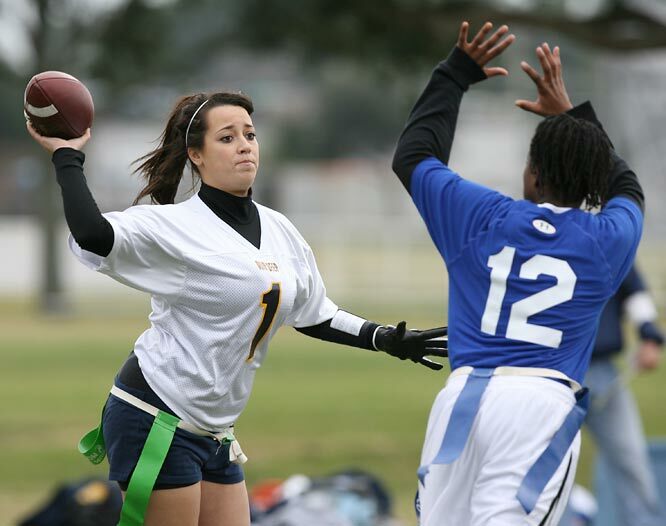 Whether you�re a veteran of flag football or just getting started, it always helps to have a few flag football plays prepared in advance. Below, I�ve included 15 assorted plays which should get you started. They include both running and passing plays, and each can easily be adapted to smaller or larger flag football teams. While you�ll be able to uncover some more free plays, you�ll also come across a wide variety of sites which offer plays for a fee. This might come in the form of a book, downloadable material or computer software. 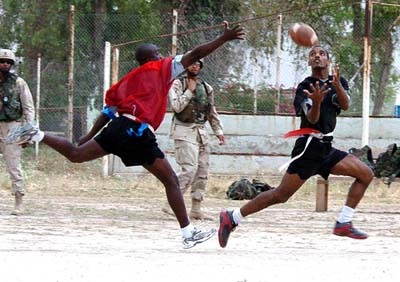 There are even programs available which allow you to use your computer to design custom flag football plays for both offense and defense. Designed to go through the middle of the offensive line, this running play is the bread and butter of many a championship flag football team. Offensive lineman will block the defenders in front of them and attempt to drive them backwards, while a fullback will be employed to run ahead of the ball carrier and clear out additional space. While much of the success of the play relies on the vision and athletic abilities of the runner, good teamwork and blocking can turn a small gain into something far more substantial. Wide receivers are lined up on both sides of the field, and the play can be tailored to go to either side. The quarterback quickly passes the ball to either receiver after the snap, and the wideout then proceeds to run up the field for five yards. At the snap, the quarterback rolls left until he�s outside of the tackles. The running back runs a vertical pattern straight up through the defense, while the left wide receiver runs an out pattern at around the 8-yard mark. As the receiver is about the make the cut, the quarterback throws them the ball. If possible, the receiver can then turn upfield, or he may simply step out of bounds. This play can go to either the left or right receiver. Following the snap, the quarterback quickly passes the ball. After the catch, the wideout heads straight upfield for five yards before turning 45 degrees and heading towards the center of the field. Once he�s reached this area, the ball carrier turns and heads in a diagonal line towards the end zone. Meanwhile, the offensive players do their best to clear a path, relying on the fact that they know exactly where the receiver is headed. This play is designed for 7-on-7 flag football, but it can easily be modified for any size team. When the ball is snapped, the two receivers on the left side of the field each run 3-yard flat routes and cross paths in order to momentarily confuse their defenders. As the receivers come out of these routes, the quarterback will hit the one closest to him. Keep in mind, however, that the quarterback should have time to see the crossing patterns develop, so he should be able to throw to the other receiver if he�s more open. A tried and true running play, the counter relies on misdirection to force the opposing team to commit to a particular direction. At the snap, the quarterback fakes a handoff to the fullback, who should be heading either left or right (depending on your preference). The halfback, meanwhile, will take a step in the same direction as the fullback, but then change directions and head the opposite way. 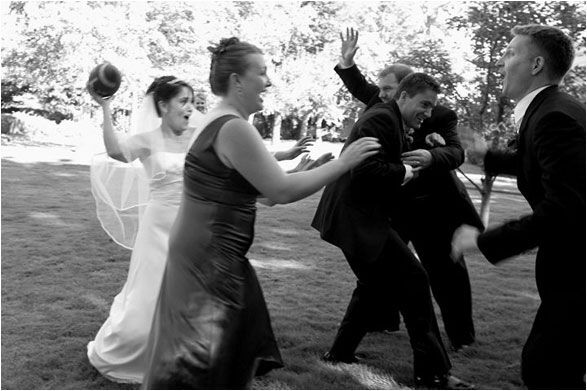 After the fake handoff, the quarterback will turn and hand the ball to the halfback. This play works best if you can get the ball into the hands of your fastest wide receiver. At the snap, the right receiver heads up the field and runs a deep slant route in an effort to clear out the defense on that side. Meanwhile, the left receiver closest to the quarterback runs an underneath route in front of the offensive line and catches the ball in the area cleared by the other wideout. Now it�s up to the ball carrier to use his speed and the other offensive players to provide solid blocking. The quarterback takes the snap and should next fake a quick pass to one of his receivers. Having done this, he then secures the ball under his arm and heads up through the center of the offensive line. On this play, it�s a good idea to keep any fullbacks or halfbacks close to home in order to block for the quarterback. 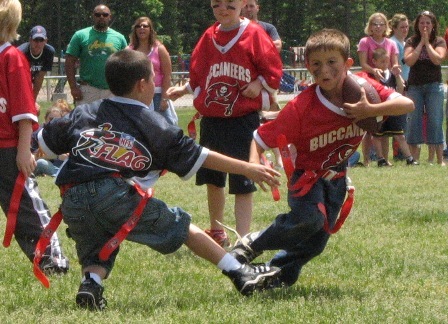 An 8-man flag football play, this can also be tailored for smaller or larger teams. Basically, the receiver on the far left of the line cuts across to the center of the field following the snap. If performed properly, the defense should be convinced that the pass will be headed to this receiver. Instead, the quarterback has the option of either running the ball up through the middle of the line or passing to another receiver. This crossing receiver simply serves as a decoy to draw defenders to him. Prior to this play, your team should execute an off-tackle run (out of the I-Formation works well). Prior to the following play, have your team line up in the same formation. While it may not work, it�s not a bad idea to try and fool the defense by letting them overhear that the upcoming play is the same one as before. Instead, the quarterback fakes the handoff and stops with his back to the line of scrimmage for a second or two. By this point, the defense has hopefully committed to the run. The quarterback then runs around the opposite end of the field. The selling of this play is especially critical. While it may work better in a flag football league for kids, you might try it out anyway and see what happens. If used sparingly as a trick play, the results may be surprising. Here�s a play for those linemen who complain that they never get the ball. At the beginning of the play, the receivers to the right should head towards the center of the field. A receiver from the left side should head to the vacant right side of the field and stop as if waiting for the pass. As this is unfolding (and timing is very critical on this play), the quarterback sneaks the ball to the center. The quarterback then runs to the right, while the center heads straight upfield. Of course, if the center has to commit to blocking a defender at the line, then this play can simply be changed on the fly to a standard passing play, or the quarterback can keep the ball and run with it. Once the ball is snapped, one receiver on each side of the line angles sharply towards the center of the field. Another receiver (lined up to the left) will go deep and draw away some of the defense. The quarterback then quickly hands the ball to the center, who proceeds to run forward and then cut sharply at a right angle. Since the receivers should have drawn the defenders to either the left or center of the field, there should be a gap on the right side. The center should be able to exploit this for a nice gain. On this play, a single running back lines up near the left side of the offensive line. At the snap, the quarterback fakes passing him the ball, then spins and starts running towards the right side of the field. If a fullback is used, he should also be sent to the left in an attempt to draw as many defenders as possible away from the side the quarterback will be running to. Receivers should run deep patterns and try to draw defenders away from the play. Originally intended for 8-man flag football, this play works especially well against a man-to-man defense. Before the play, two receivers should be lined up on each side of the field. The remaining three players who aren�t the quarterback will stay on the line of scrimmage. When the ball is snapped, each receiver will run forward three steps. Then the outside receivers will cut towards the middle of the field. Inside receivers will take a total of four steps after the snap and then cut to the outside of the field. Outside players should be certain to cut after the inside receivers. From there, the quarterback can sit back and throw the ball to the most open receiver (which should be 1 of the two receivers running the crossing routes in the middle of the field). This formation begins like the previous play (two receivers on each side, with three offensive linemen). However, in this case, you may want to make sure that the blocker on the far right side of the offensive line is one of your faster players. After the snap, the inside wideout on the right side will move down and block the defender on the end of the line of scrimmage (this will free up that speedy lineman we were just talking about). The outside receiver on the right side will move one step forward off the line and then turn and run parallel towards the left side of the field. The quarterback will hit this player on the run, and the speedy lineman will run towards the receiver. As the receiver runs left, the lineman will pass by him headed right. The receiver will quickly pitch the lineman the ball, and he will turn upfield (hopefully for a big gain). 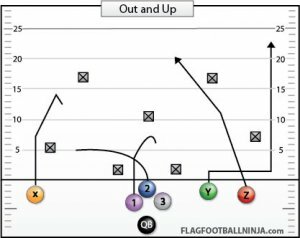 If you’re looking for more flag football plays, we recommend you pay a visit to Flag Football Ninja.